Imagine a future where your home generates its own electricity via renewable sources, which in turn uses that electricity to create hydrogen to power your vehicle. Your garage becomes a mini Shell forecourt, your energy bills are almost non-existent, coal power is committed to the history books and we all live happily every after… off the grid. A one-fingered salute to the man, more disposable income for the little guy and a cleaner, greener world to live in. 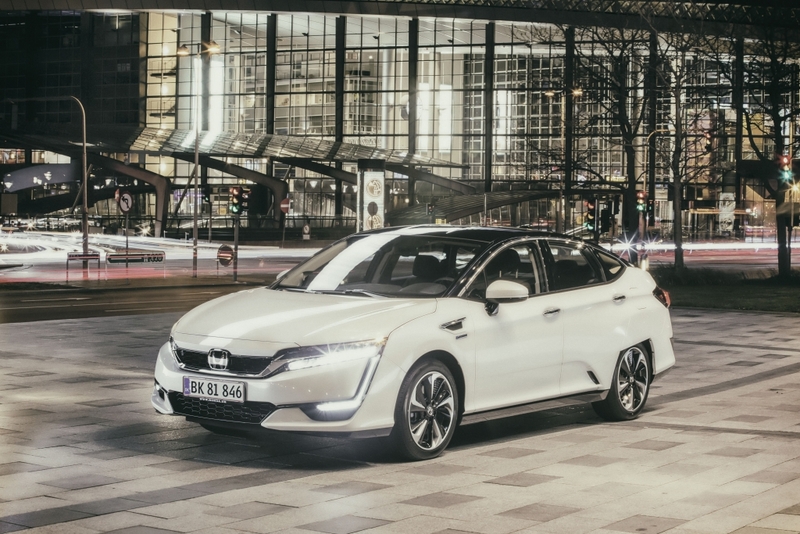 It might sound like a fantasy scenario but Kiyoshi Shimizu, Chief Engineer at Honda’s Fuel Cell programme, believes that it is not so far-fetched. 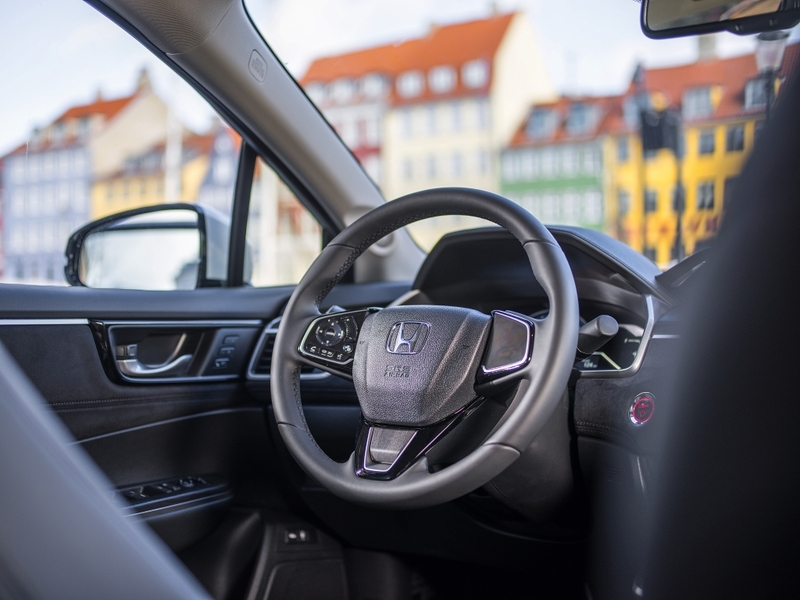 “Currently, we can fit a hydrogen fuelling station inside a small shipping container and place it on a petrol station forecourt, but as technology improves, it is conceivable that we could bring it into the home,” he explains as he shows me around Honda’s latest hydrogen-powered creation. Rewind some twenty years and Honda was busy experimenting with hydrogen power in the V0 concept machine, a bulky vehicle that took two hours before it was suitably warm enough to work. The Honda FCX, which was released in 2002, was arguably the Japanese marque’s first proper hydrogen-powered car to appeal to the consumer and the recent 2008 FCX Clarity was actually a mild success in Japan and California, where hydrogen fuelling stations compete with electric charging points and other green transport solutions. 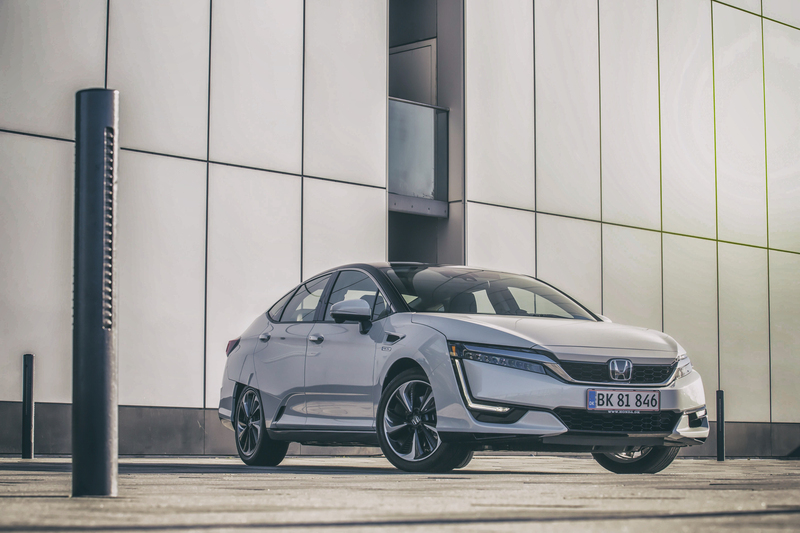 But the latest Honda Clarity model has been thoroughly refreshed and rides on a completely bespoke platform, features lighter and stronger materials, an all-new interior and the promise of an impressive 435-mile range from the on-board tanks. That makes it officially the furthest one can currently travel in a zero emissions vehicle. Not bad at all. We might have arrived at Copenhagen Airport to clear skies and a cool breeze but the weather is not playing ball on the day that we are due to drive Clarity. Parked outside the hotel, the new Honda Clarity cuts an imposing figure, as its LED lamps slice through the pouring rain. Granted, the styling won’t suit all tastes and it does look kinda awkward from some angles, but it is modern, futuristic and suitably Sci-Fi for such a progressive machine. It is a more pleasing scene inside, where a number of environmentally friendly materials have been adopted. For example, the wood-effect dash is crafted from recycled plastics, while the ‘Prime Smooth’ faux suede found on the seats is fashioned from a plant derivative. There’s not a dead cow in sight, while the air conditioning system employs a complicated network of sensors to detect tailpipe emissions and activate a bespoke filter to keep those inside breathing easy. Clamber into the cabin, depress the familiar red Honda ignition button and the various screens come to life. There’s a touchscreen infotainment system in the middle of the dash, as well as digital read-outs of remaining hydrogen levels and battery charge status surrounding the instrument binnacles. It feels familiar but special. There’s no transmission tunnel, so Honda has introduced additional storage areas (including and NFC charging slot for phones) and extra cubbyholes. Room in the rear is also excellent, with plenty of leg and headroom for three adults, although boot space does suffer at the hands of two enormous hydrogen tanks. A quick lesson before we hit the road: hydrogen doesn’t technically drive the wheels of this hydrogen-powered machine. 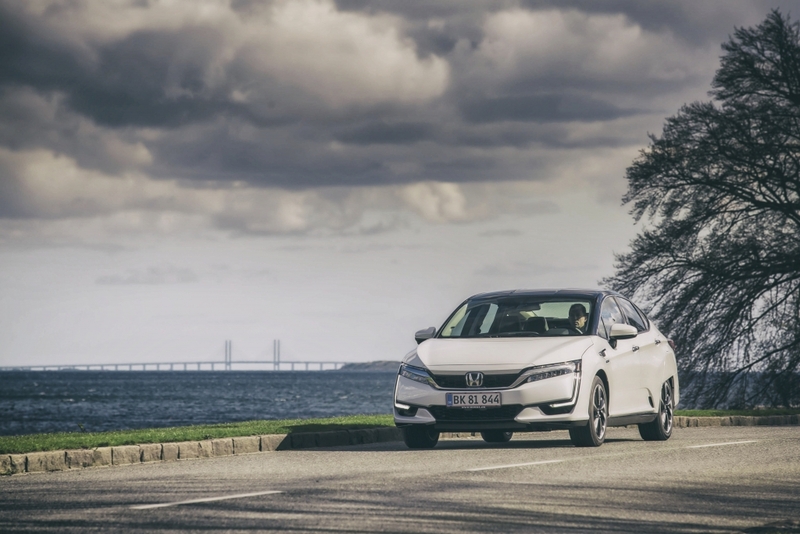 No, the Honda Clarity draws hydrogen from two highly pressurised tanks at the rear of the car that feed a fuel cell stack located above the electric motor, which is housed underneath the bonnet. Somewhat amazingly, the new fuel cell stack/electric motor combo is actually smaller than the V6 petrol engine that’s found in the NSX. You can thank Honda’s biggest brains for that. This fuel cell stack then converts hydrogen into an electric current that is drawn by the electric motors or stored in on-board battery packs for later use. In that respect, the Honda Clarity is like many of the electric vehicles on sale today, albeit one that can be ‘recharged’ in a couple of minutes and go on to achieve over 400-miles of range. Our route takes us from Copenhagen Airport, along Route 16 towards the fishing village of Helsingør located to the north west of Denmark’s Sjælland Island. It is absolutely chucking it down outside but the Honda Clarity feels assured and planted on the road. Power delivery is incredibly smooth and acceleration is exactly as you’d expect from an electric vehicle, powerful and instantaneous. There’s a distant whine from the electric motor when the accelerator is depressed but additional road noise and tyre roar is kept to an absolute minimum thanks to acoustic windshield glass and extensive sound deadening throughout the cabin. Rival electric cars (and a certain Hydrogen offering from Toyota) tend to feel overly firm, as manufacturers attempt to disguise the additional weight with suspension tweaks. Not so here. The springs do an excellent job of ironing out rough bits in the road, gliding over bumps and delivering a serene drive along Denmark’s motorway system. 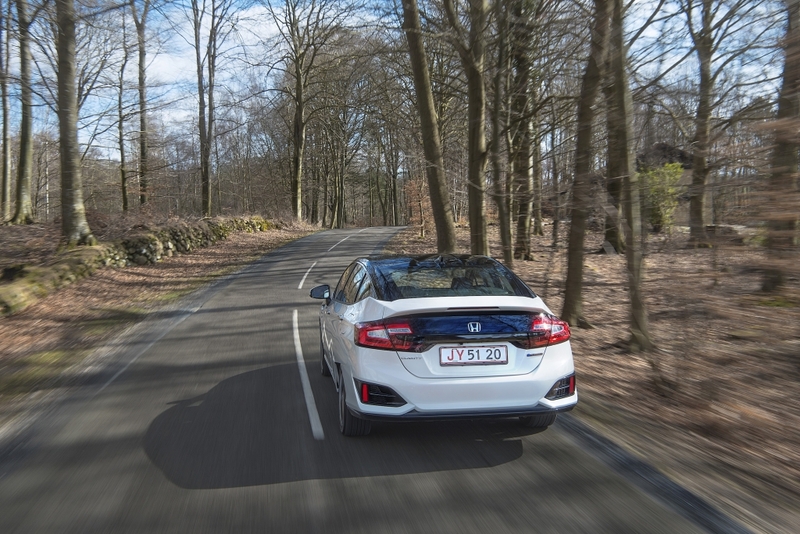 Naturally, the hydrogen tanks, electric motors and battery packs weigh a fair amount (overall kerb weight is 1800kg), so high-speed cornering isn’t exactly the Honda Clarity’s forte, but it can be fun. There’s a sport button nestled in the central console that weights up the steering, improves throttle response and beefs up the regenerative braking for a slightly more enthralling drive. 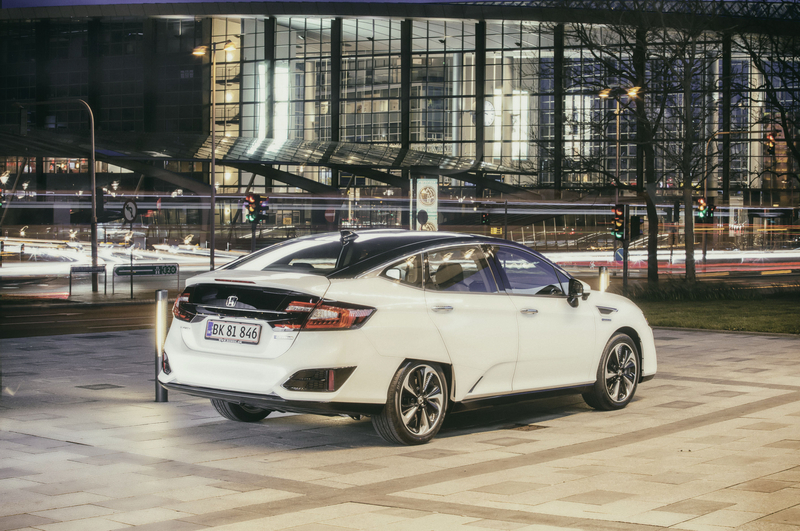 It’s no sports car, think of it more as a luxury sedan, but the electric motor delivers a nice dollop of shove to make overtaking manoeuvres easy. We snake our way back along the 152, the grey waters of the Øresund sloshing away to our left, while enjoying the colourful rustic houses that litter the small villages we pass via the commodious glasshouse of the Clarity. It isn’t until a few hundred miles into the journey that I notice a distinct lack of range anxiety. Frequent glances at the dials were abandoned very early on and the H2 read-out claims we still have well over three quarters of a tank left. And that’s the beauty of a hydrogen-powered car: there’s no worrying about the windscreen wipers draining precious battery packs (thank God), the sound system can be cranked up and the heated seats abused safe in the knowledge that there’s plenty of miles left in the tank. Filling up is also a complete doddle. It’s as simple as pulling up to the pump, slotting a hefty nozzle into the filler cap and pressing a button on a rather industrial-looking machine. 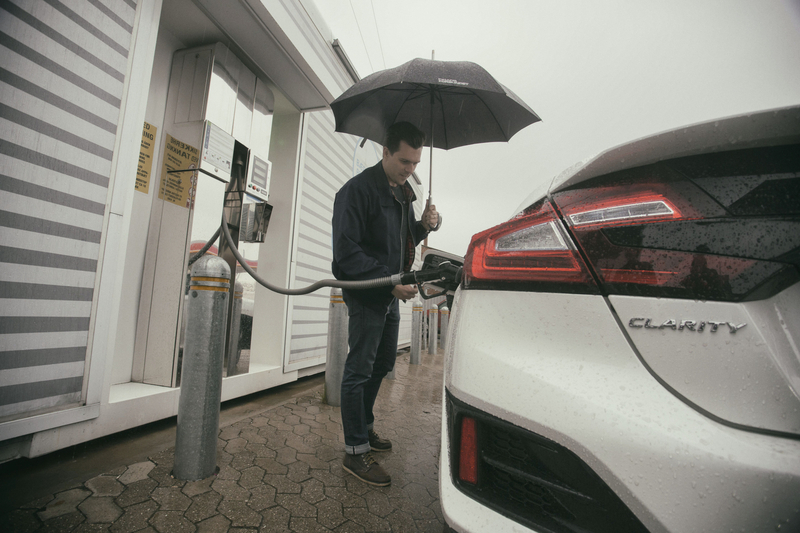 There’s a bit of noise as the hydrogen pumps reach the required pressure and the hydrogen nozzle gets icy cold as it turns from liquid form to gas but that’s the extent of the weirdness. It all feels very familiar, stood here in the Danish drizzle, umbrella opened as I wait for the hydrogen tanks to be filled. It takes around three minutes (and about £45 in fuel) before I’m able to drive away again. 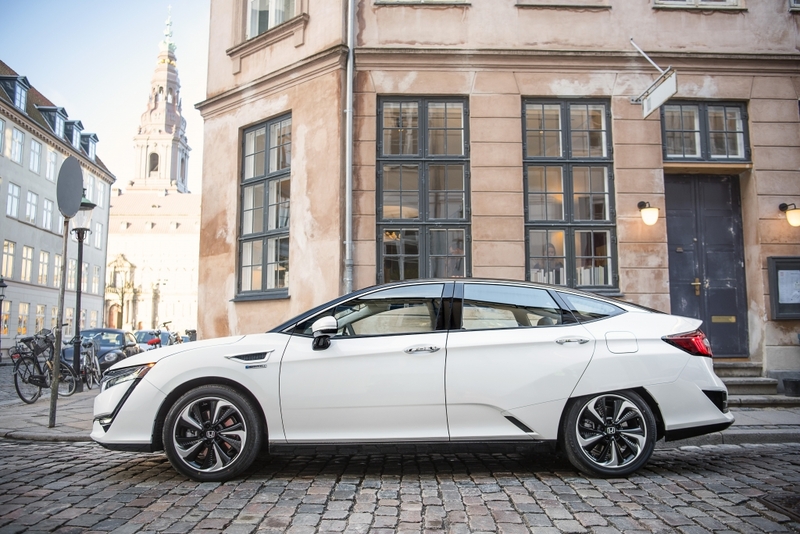 There are currently 90 publically accessible hydrogen-fuelling stations in Japan, a similar spread in the USA and 16 in Denmark. There are just six in the UK and they are mostly clustered in the southeast. It doesn’t take a genius to recognise that a poor hydrogen network is one of the major roadblocks standing in the way of this technology. That’s why the Clarity will only go on sale to consumers in Japan and is available to lease in California. It won’t be coming to the UK, not in this guise at least. 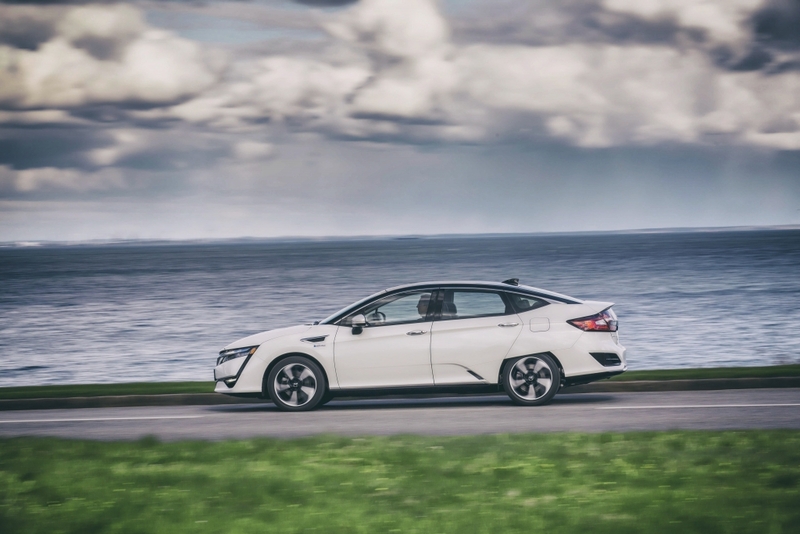 Instead, Honda will donate a number of cars to Europe (two will come to the UK) and ask a couple of lucky customers to run one for a few years to see how they get on. 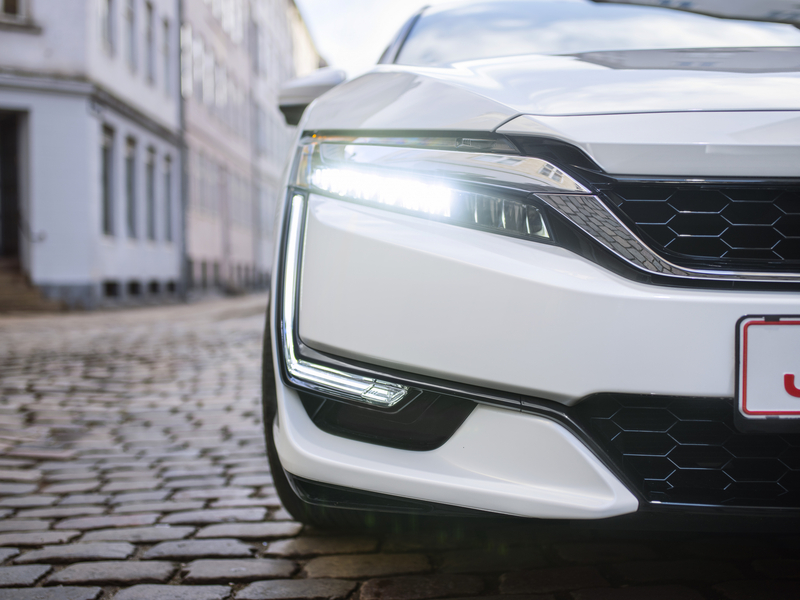 Honda, being the sticklers that they are, will then farm a huge amount of data and customer feedback in order to make the final production version as good as it can be. 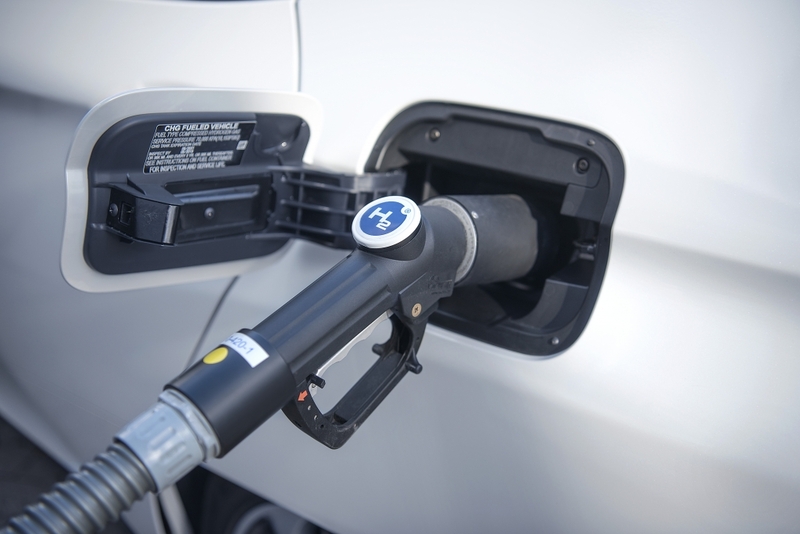 Meanwhile, various government initiatives will slowly expand the hydrogen network in the UK and across Europe, as well as standardise the payment system. Today, users are required to sign up to a provider and use a chip or card to pay for the fuel, which is then billed to an account after swiping. Thanks to the numerous providers, drivers may have to sign up to a number of accounts in order to use the full network, which is understandably annoying. 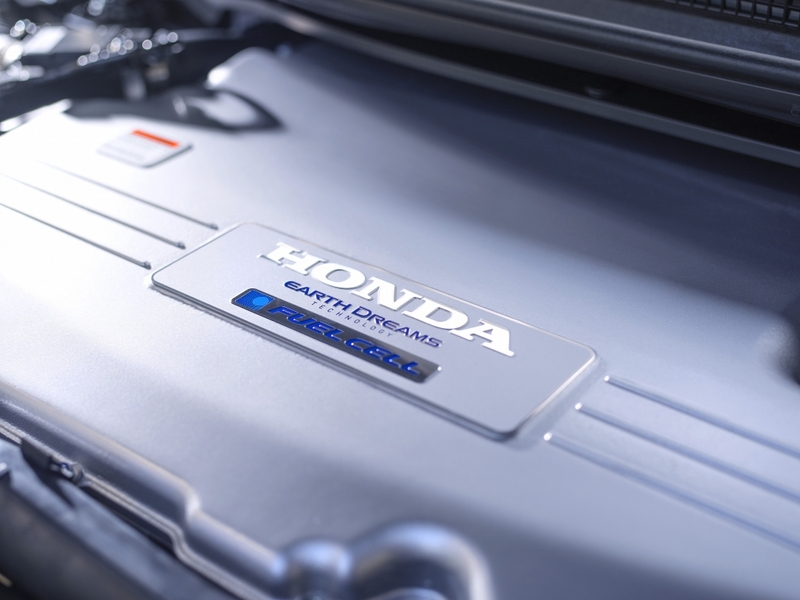 There is also the thorny issue of price, with Japanese Claritys costing the customer around £41,000, while Honda admits the money required to further develop the technology is mind-boggling and not sustainable on its own. Plus, creating hydrogen for use in a vehicle is an energy-intensive process. Is there any point running a car on H2 if creating the fuel requires a dirty coal-fired power station? Probably not. But if the gas can be produced via green means, such as wind and solar power, it becomes a very interesting proposition. And if the time comes where it is possible to produce the fuel for your car from the comfort of your own home, that’s reason enough to get excited for the future. Excited by the future or perplexed at the prospect? Head over to our Facebook page and get the conversation going.